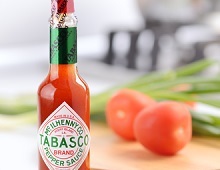 One of the most popular hot sauces in the world is Tabasco. Everyone wants to know how it’s made. The recipe and process are very simple… First you start with the peppers. Tabasco peppers planted and grown on Avery Island are allowed to ripen to a deep red color. The peppers, when ripe, are picked by hand and then mashed, mixed only with a small amount of salt… the salt (believe it or not) comes from the salt mines under Avery Island. The mashed peppers are then packed into wooden barrels and topped with a bit more salt. The barrels full of mashed peppers are then left to ferment for up to 3 years. You’ve got to have some serious patience to make Tabasco! Finally, after 3 years, the barrels of mash are ready to be mixed with distilled vinegar. The mashed peppers are mixed and steeped for several weeks in vinegar… then the mixture is strained and bottled. The steps are easy, but it takes a bit of work to make authentic Tabasco pepper sauce. Check out this video by CCTV. They do a tour of the Tabasco facility. Here’s another great video of a tour I found on Zaggat’s YouTube channel. Finally, if you’re looking for a recipe to make your own Tabasco recipe, check out this video for homemade tabasco sauce. It’s not authentic, but it’s a decent copycat.